To develop your child’s motor skills and build his/her confidence, buying a kick scooter is necessary. A scooter also prepares your child for learning how to ride a bicycle. Choosing a scooter for kids is complicated compared to choosing one for an adult. So how do you settle for the best one? These factors will certainly help you land the best one. 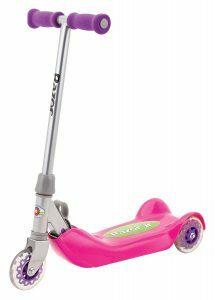 Of the many scooters available for kids, the best one is the Razor Jr. Folding Kiddie Kick Scooter. Designed for young riders, this kiddie kick scooter boasts a three-wheeled design that helps maintain balance and build coordination. It features a wide polypropylene deck that’s slip-resistant. As a parent, you’ll love the scooter’s folding mechanism, which allows effortless transportation and storage. If you have a little one (s) of age 3 and above, there’s no doubt that this product from the Razor scooter range is the best for them. Folding mechanism ensures you enjoy compact storage as well as a highly convenient way of carrying your kid’s scooter. The scooter features an effortless to grip soft foam handles. It has a slip resistant Polypropylene deck. The scooter has one rear brake and two urethane wheels in front for safety and stable steering. From the many reviews available online, none seems to indicate any cons of purchasing this scooter. The only drawback with the countable ones had to do with folks experiencing difficulty with the wheel moving. With any type of scooter, it’s always important to buy some protective gear for your child. That will go miles in making sure that he or she is safe when riding. Fortunately, both in offline and online retail shops, fancy armbands and helmets exist for you to choose from. When making a purchase, it’s prudent to order everything all at once so that your little one can enjoy the new adventure immediately he or she unwraps paper from the box. In the recent past, scooters have tremendously grown in popularity. In fact, they top the wish list of children of all ages. Whether your little one is a pro or learning the ropes, there’s no doubt that scooters are an amazing way of exploring neighborhoods on weekends, liven up school runs, hanging out as a family and minimizing screen time. 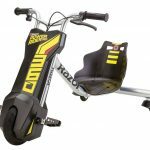 The Razor Jr. Folding Kiddie Kick Scooter is undeniably one of the best scooters for small riders. All the features it brings with it will not only help your kid to be stable and safe but also develop coordination and balance. It also helps your kids build confidence when it comes to the fundamentals of scooting. 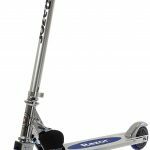 Have you been looking for the best scooter for your young one? If you have, then look no further than the Razor Jr. Folding Kiddie Kick Scooter.